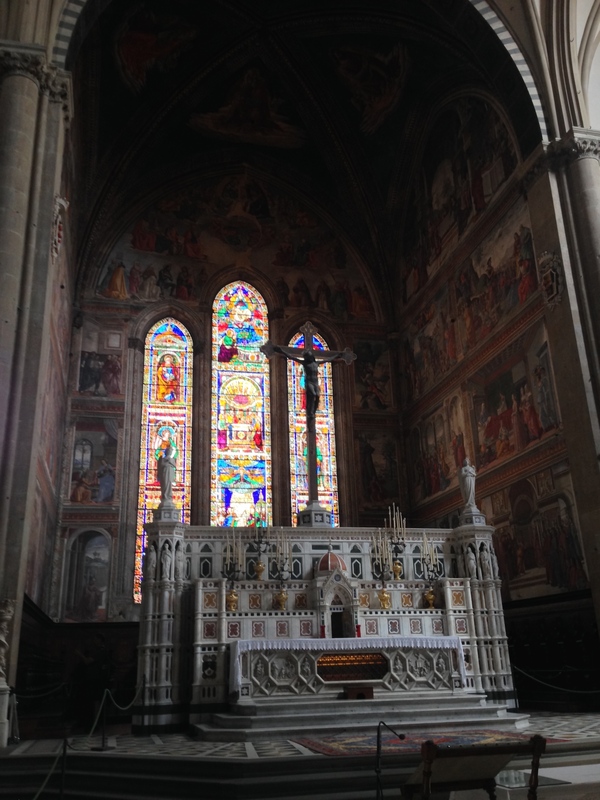 Yesterday we went to the Bascilica of Santa Maria Novella. 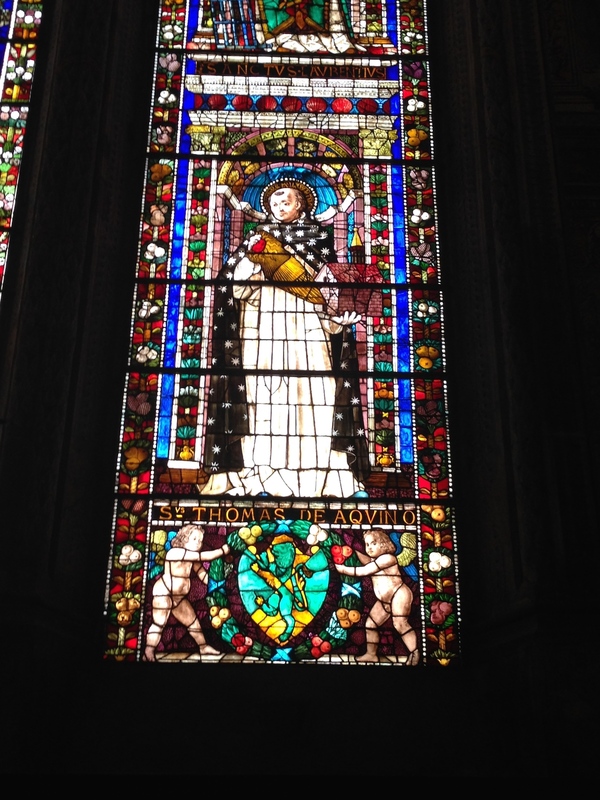 It is a Dominican Order church and dates back to the 13th and 14th centuries. 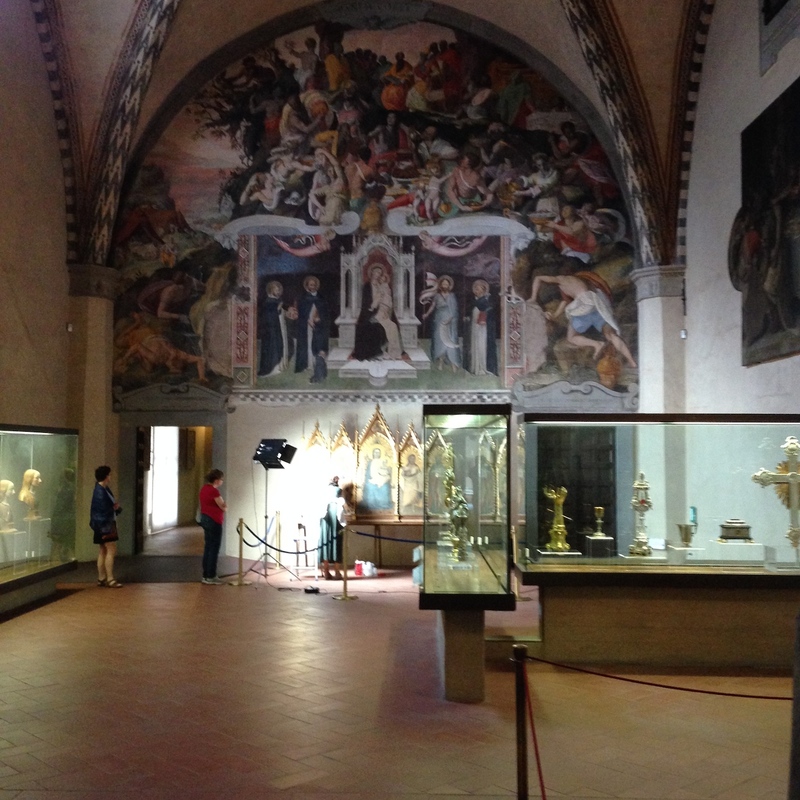 All the leading families of Firenze contributed to the building and art works as a form of receiving indulgences. 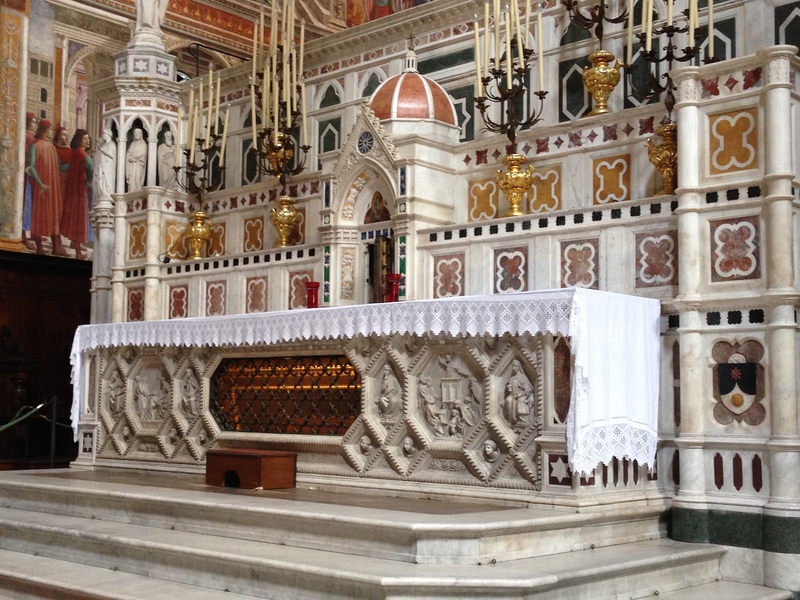 I will let the photos tell you more about this beautiful and holy place. 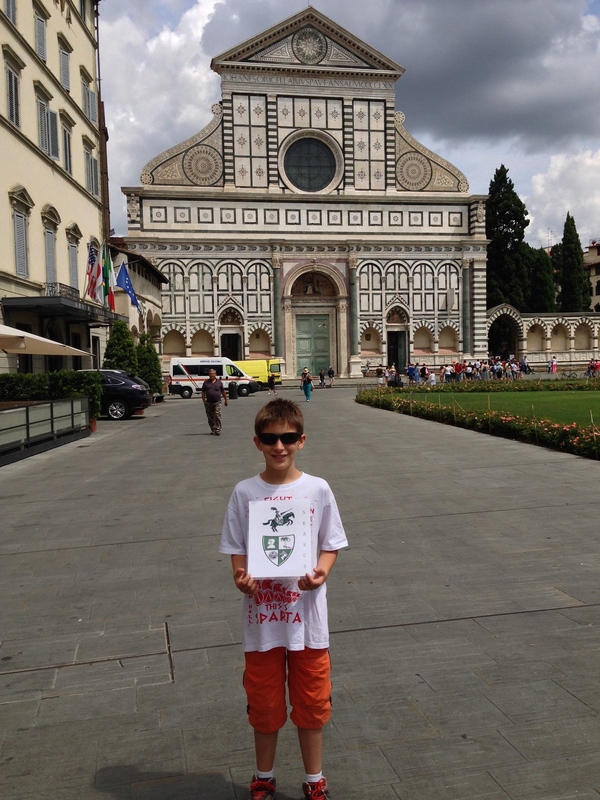 In front of the great Dominican basilica of Santa Maria Novella in Firenze. Wow! What a church. The Main Altar of the Bascilica. 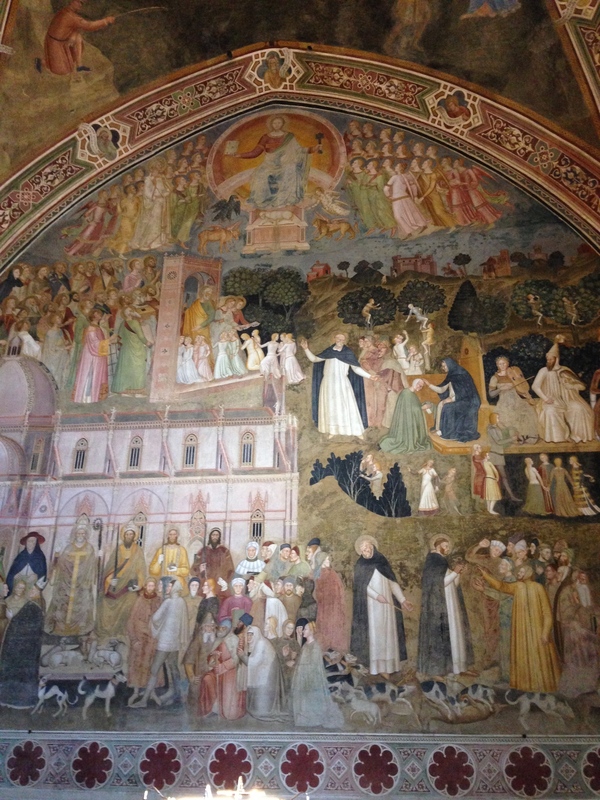 A fresco on the side wall behind the Altar. 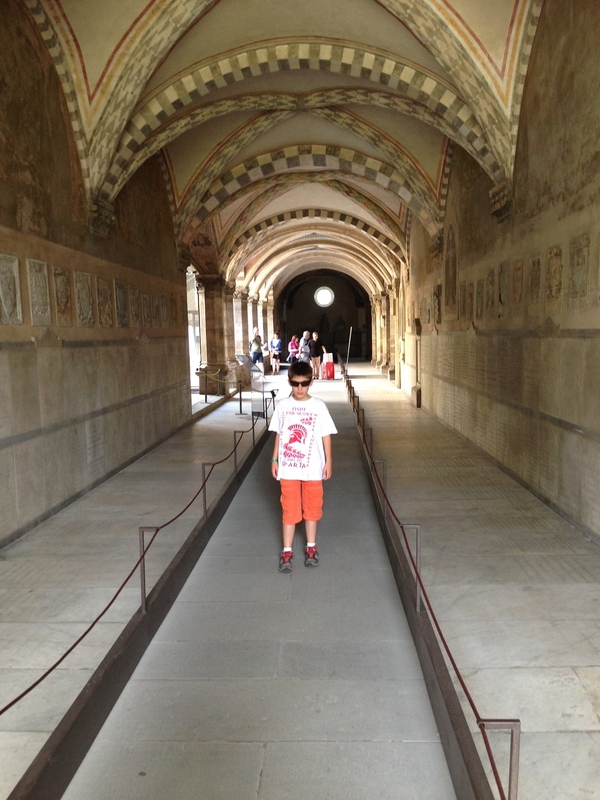 The passage to the Cloister of the Dead. 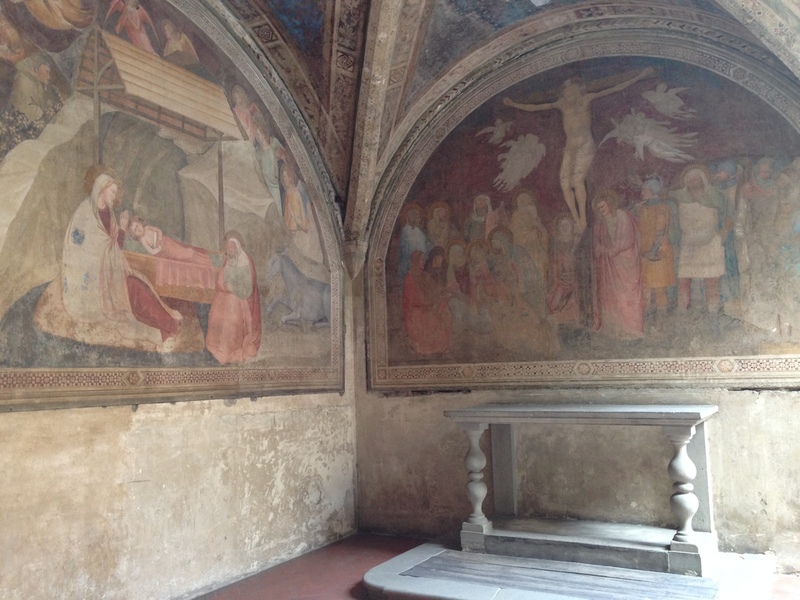 A fresco on the walls of a small chapel in the Cloister of the Dead. 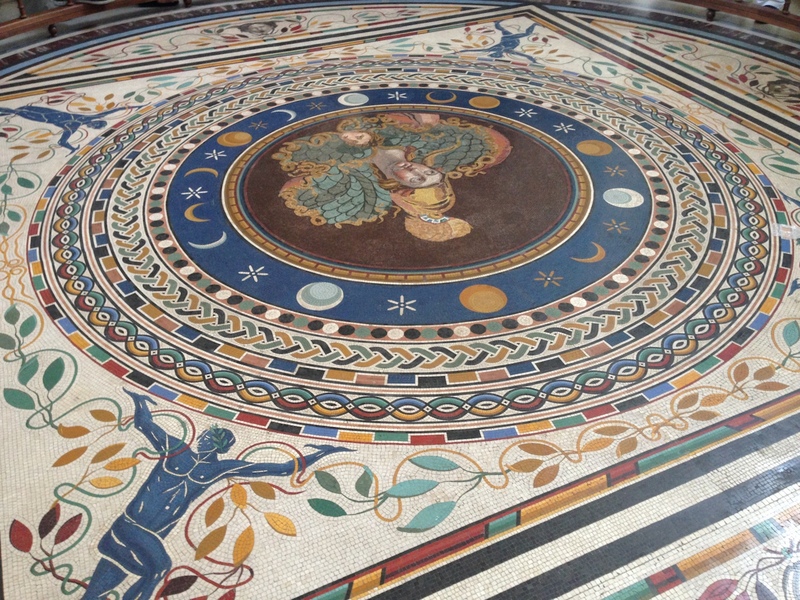 The marble floor and funeary of the Spanish Chapel. A beautiful fresco of the crucifiction of Jesus. 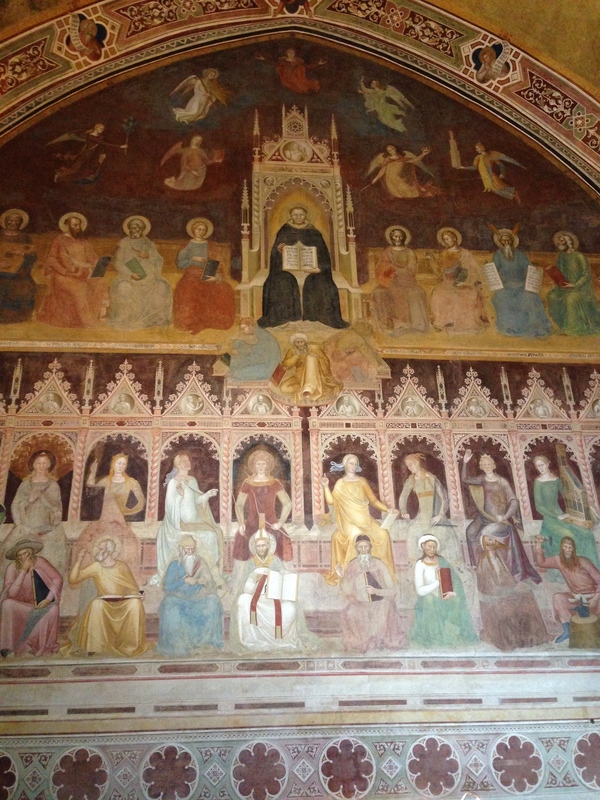 On the facing wall to the entrance of the Spanish Chapel is another of the Bonaiuto Fresco’s completing the trilogy. 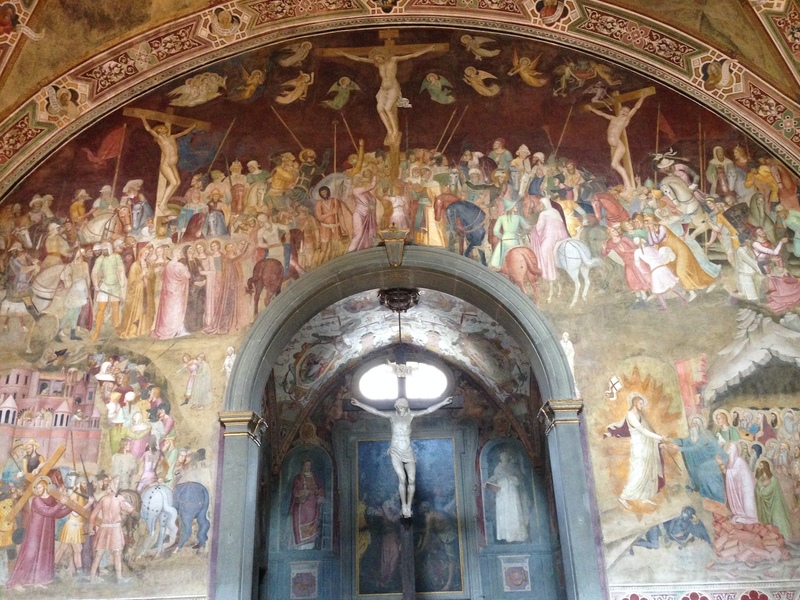 On the other wall of the Spanish Chapel is Bonaiuto’s companion fresco, “The Triumph of the Christian Doctrine”. The Green Cloister east wall. 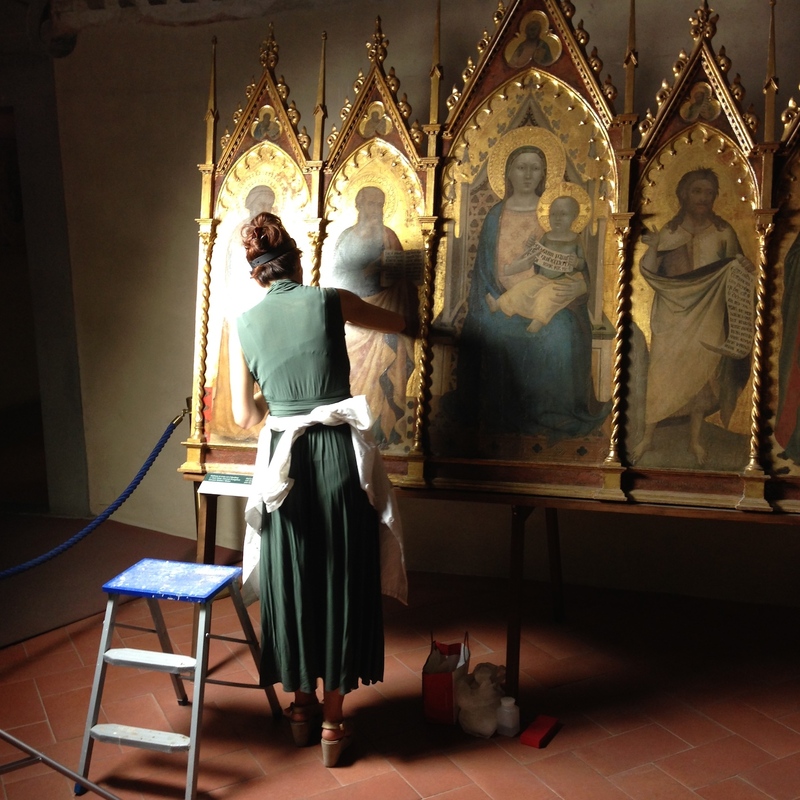 In the Refectory, off of the Ubriachi Chapel we found this restorer working on an Altar piece by Bernardo Daddi who was famous for these pieces of religious art. 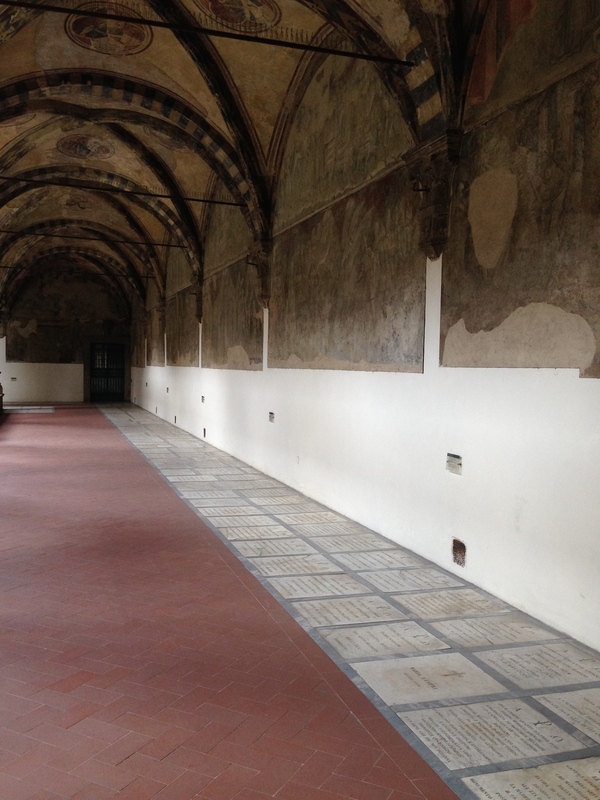 Inside the Refectory off of the Ubriachi Chapel where the restorer is working on the Bernado Daddi altar piece. 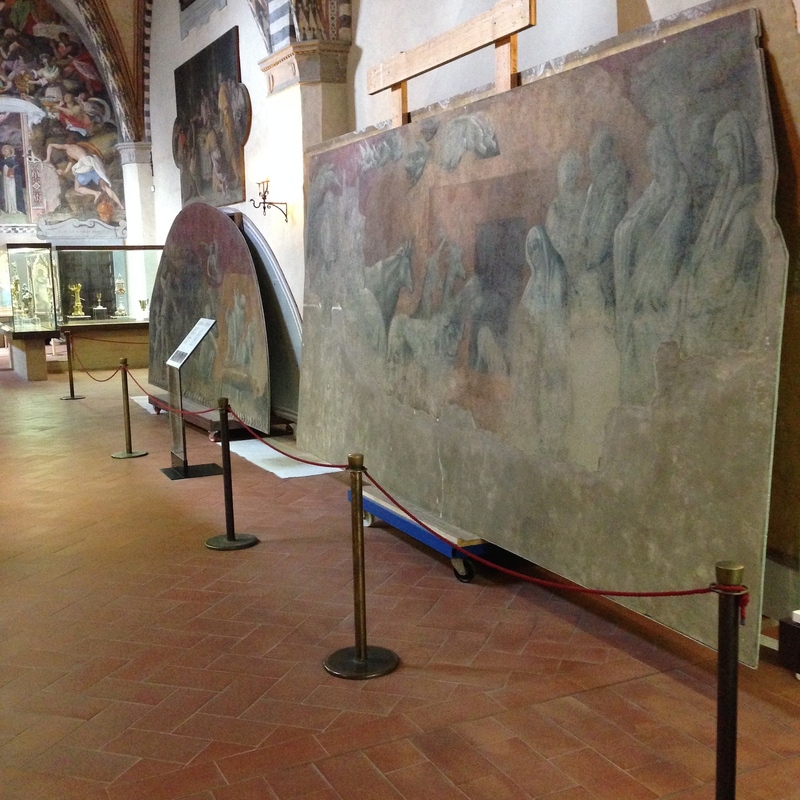 These are frescos that they cut down from the walls of the “Green Cloister” that they will now restore. 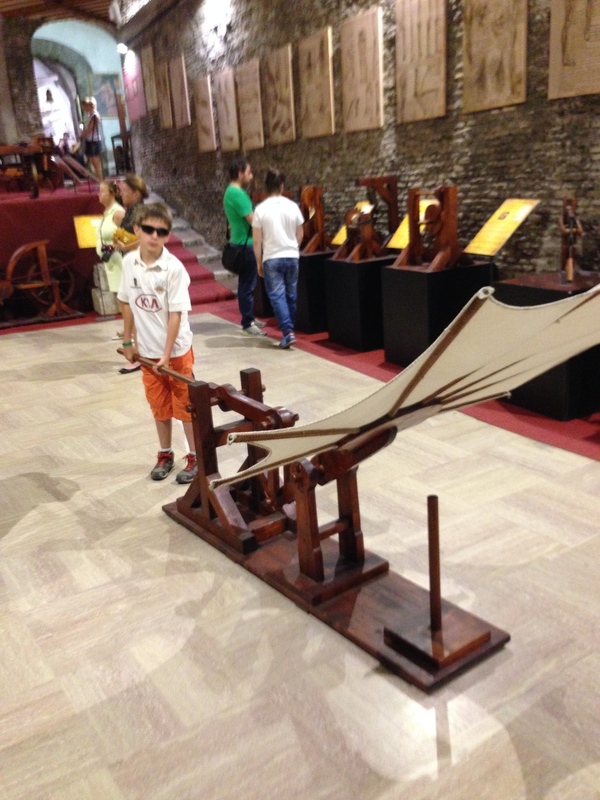 This is Frederick and we are in Montecantini Terme, just back from a quick drive and walk around Montecantini Alto. Now it is off to dinner at my Mom’s friend’s house. We are having Octopus. Yuk! 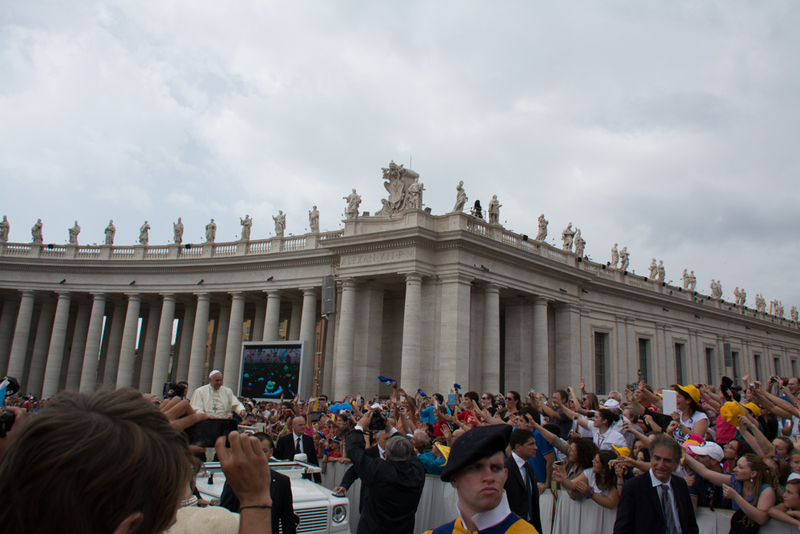 Papal Audience, June 25th, St. Peter’s Square, Rome. We were assigned tickets through our diocese of St. Augustine upon request to the Pontifical College of North America, the Seminary in Rome located near the Trevi Fountain, where we had to go to pick up the tickets. The same nuns from the Sister of Mercy order we met at the English mass on Sunday at Spirito Sancto in Sassia church were there to tell us when to get there on Wednesday and where to sit or get close to like the barricades for close photos of the Holy Father. Here are the photos my Mom took – it started to rain a few times but quickly passed. 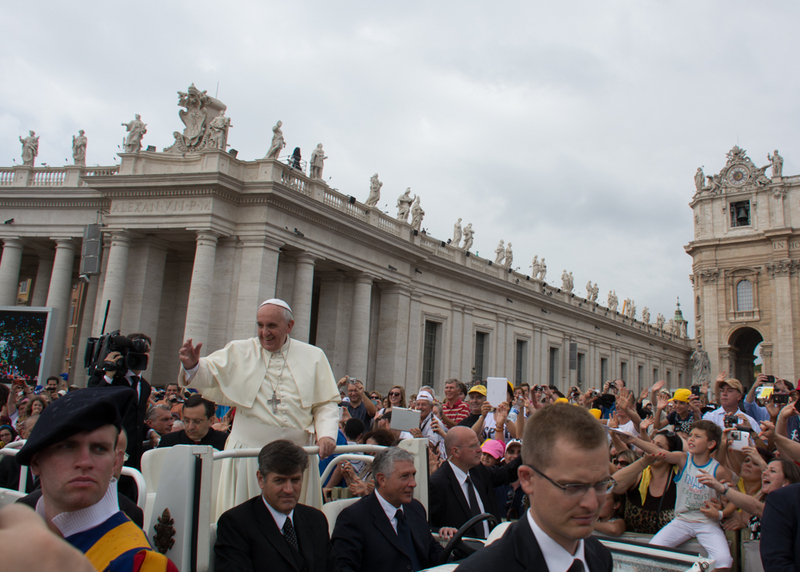 I am so happy to have seen the Pope up close and prayed along with him all the people of the world. 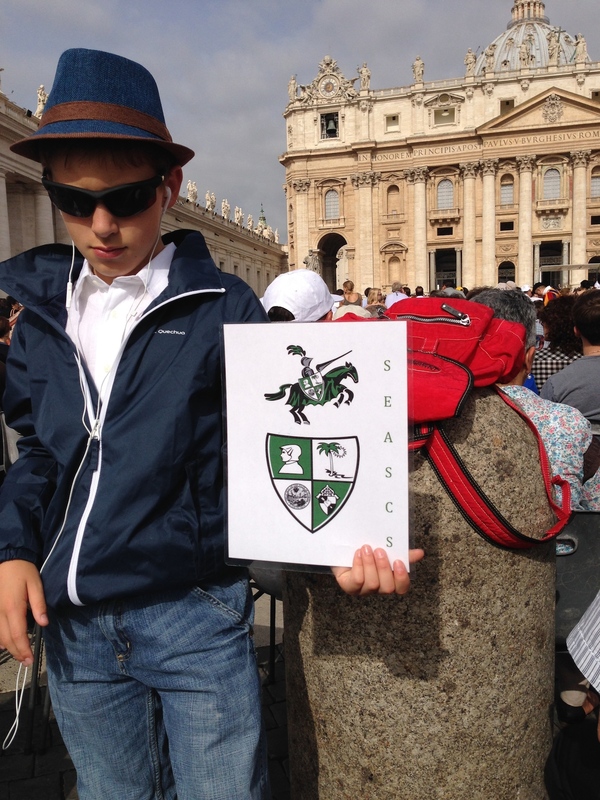 Wednesday, June 25th, at 8:30am in St. Peter’s Square. The crowds began to form at 7:00am. We are in the middle near a barricade for good photos of the Pope when he comes by in his Popemobile. 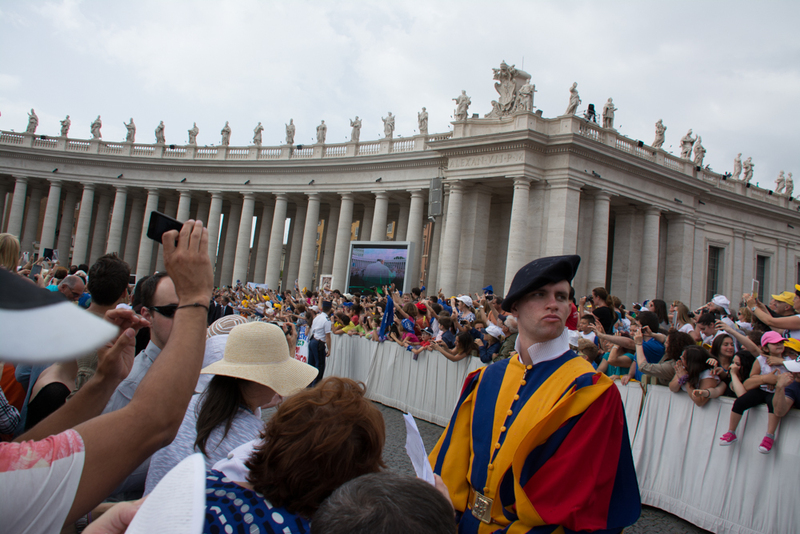 All along the traffic lane for the Popemobile there are Swiss Guards stationed along with Polizia from Rome. They must be Catholic, single men, between the ages of 20 and 32, having served in the Swiss Army. The excitement builds along the barricades waiting for the Pope to come by. Il Papa, The Pope, The Holy Father. 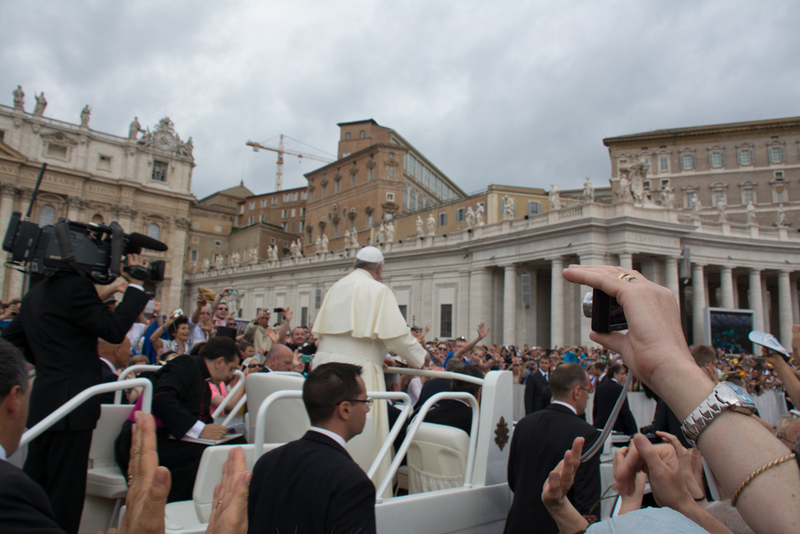 I am just below the lens of my Mom’s camera as we get the first photo of him in his Popemobile. 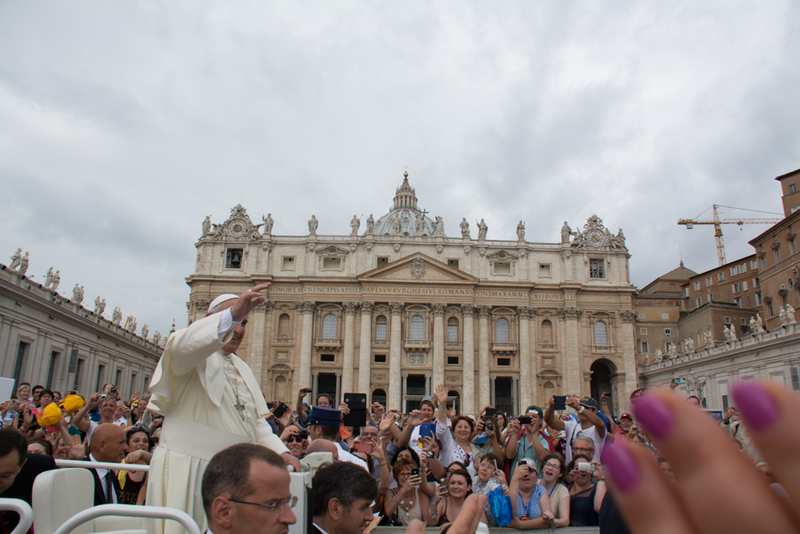 The Pope was always smiling and waving to crowd and sometimes he would stop and hug someone or give them a handshake. Now he is right in front of me but I am so small compared to the other people he can’t see me. I wish he had stopped to shake hands. He rode around the square like this for close to half-hour. We were lucky to be so near. This is Frederick and I am now in Firenze (Florence). More later. Ciao! 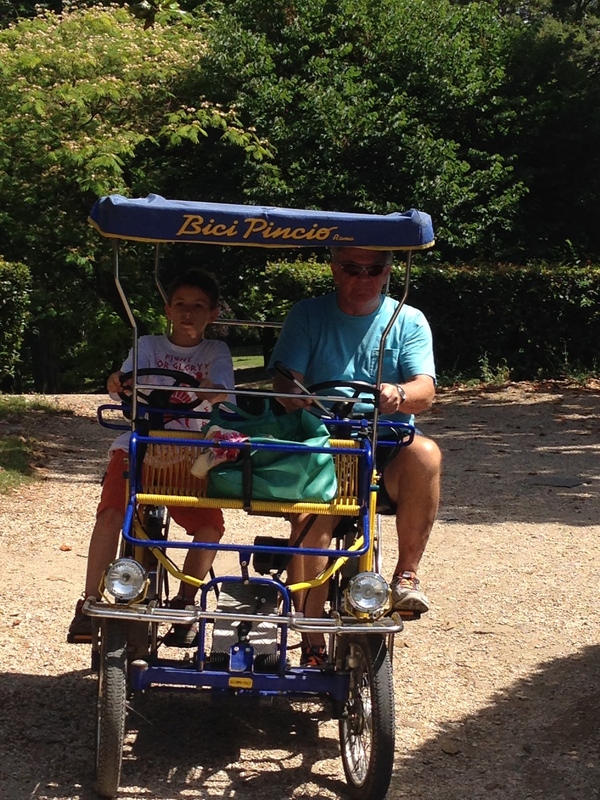 Yesterday, we went back up to the Park Borghese via the Veneto and rented a Rició 3 person 4 wheel bike. I saw them the first time we went to the park and wanted to get one and ride it around. My dad and I on the Rició in Park Borghese. You pedal and the electric motor kicks in. I had to do this bike ride as soon as I saw it on our first day in Rome. Then we went to lunch in La Casina the nice little restaurant in the middle of the park. 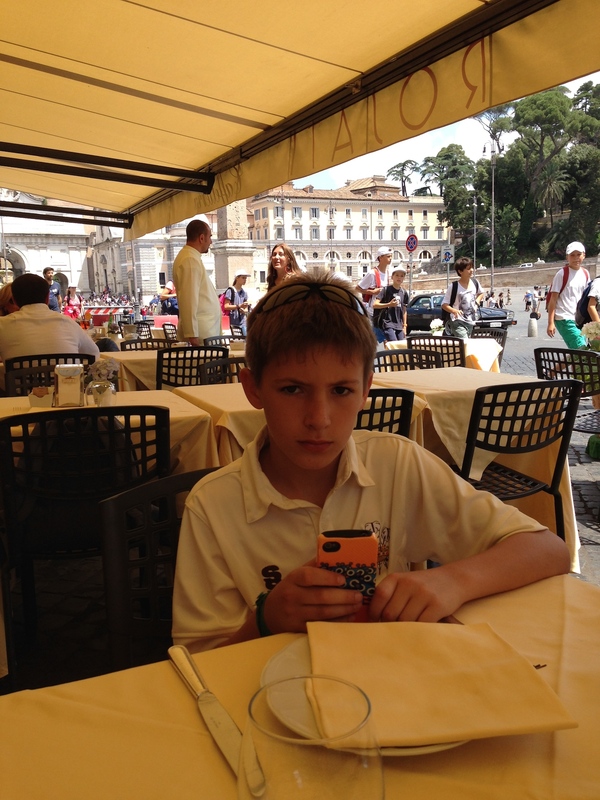 We had lunch at La Casina in the Park Borghese after our Ricio bike ride. 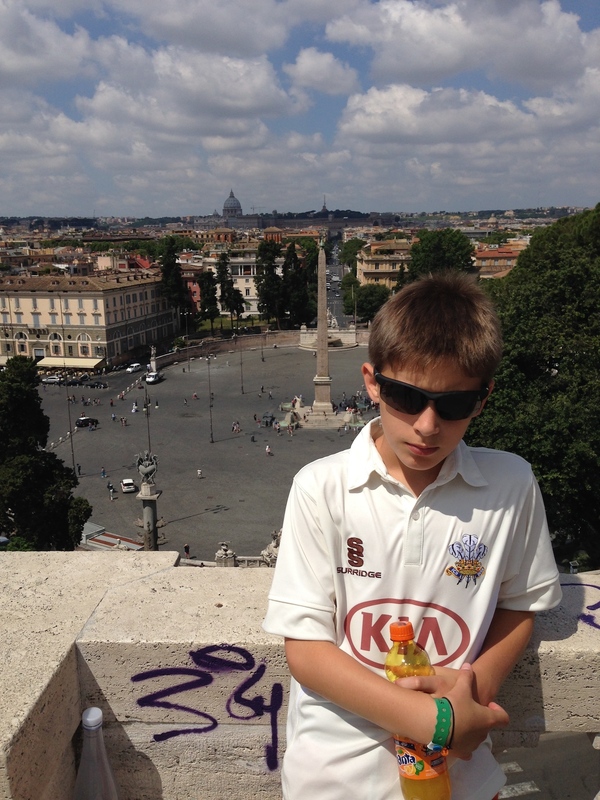 From the Park we walked down to Piazza Popolo and then down the Rizone to the Vatican Museum to see the Sistine Chapel. 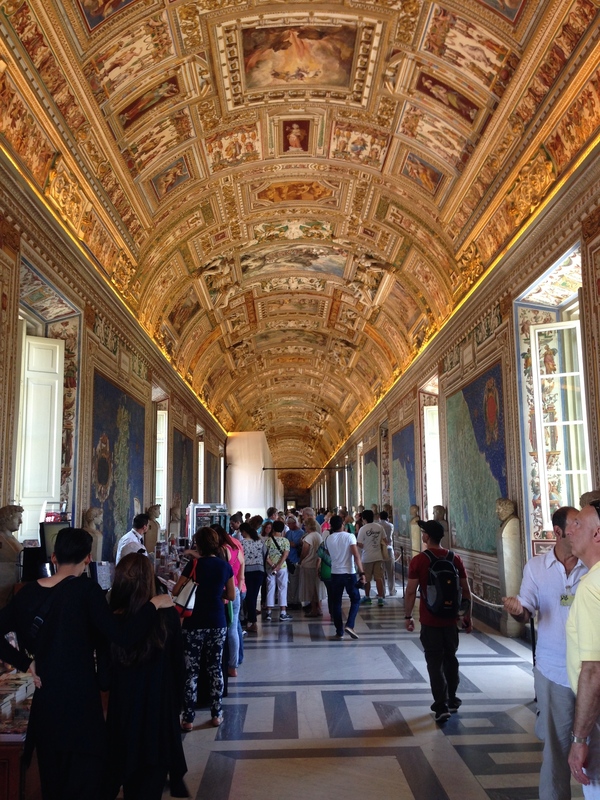 We got our audio guides wtih our prepaid tickets and decided to just walk the halls and look at all the rooms then climb down the stairs to the Sistine Chapel. NO CAMERAS allowed in the chapel, so no photos. But it is everything the guides, books and photos I have seen say it is. This is one of the two Rooms of Animals. 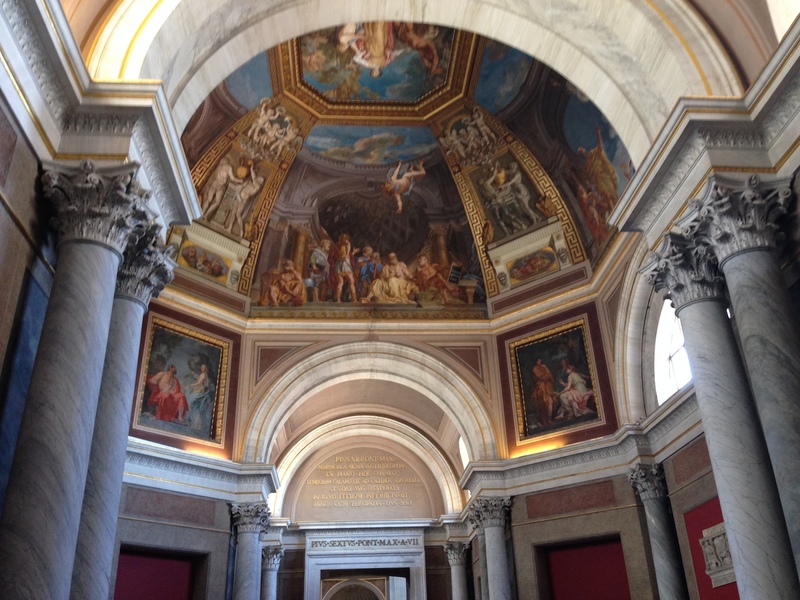 Wonderful ceiling art on one of the halls to the Sistine Chapel. 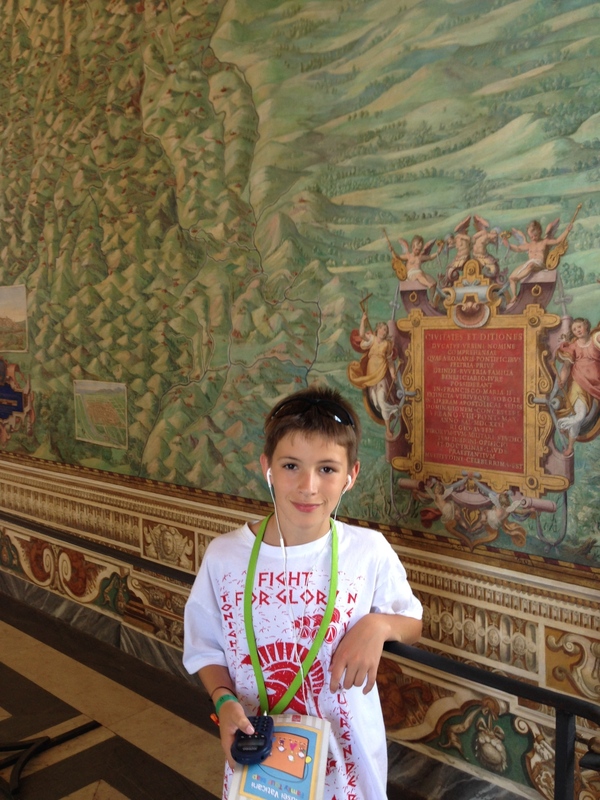 In the Hall of Maps at the Vatican Museum. 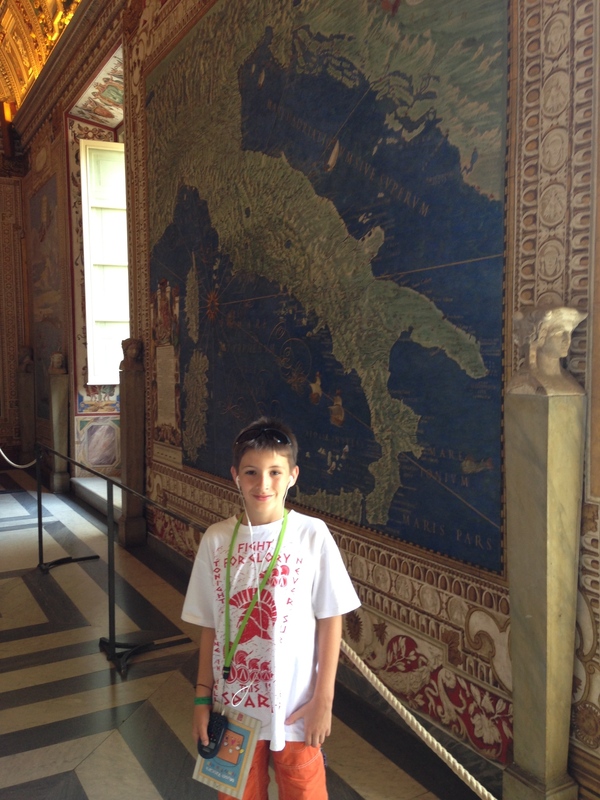 In the Hall of Maps I am standing in front of the one of Italy. 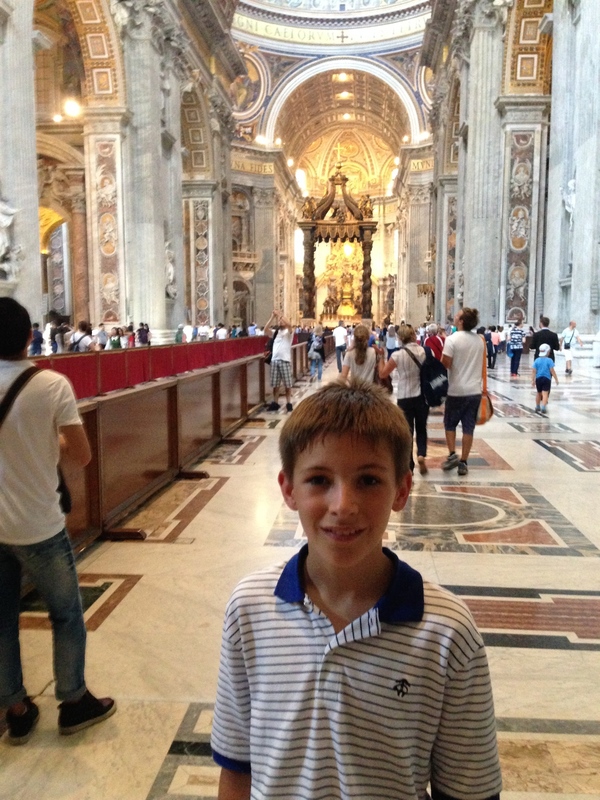 This is Frederick and today we went to the Papal Audience in St. Peter’s Square. My mom took lots of great photos that I will post soon. 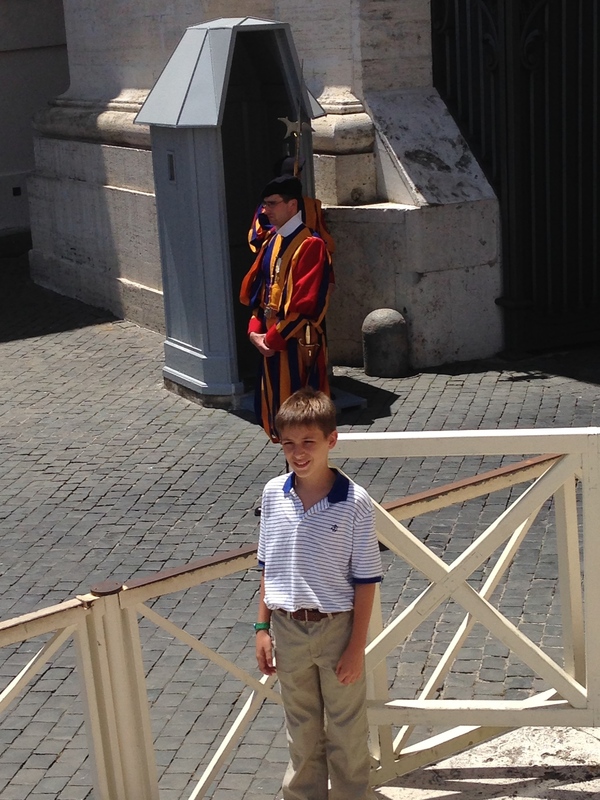 But here is one of Fred Hollywood getting ready to see the Pope. 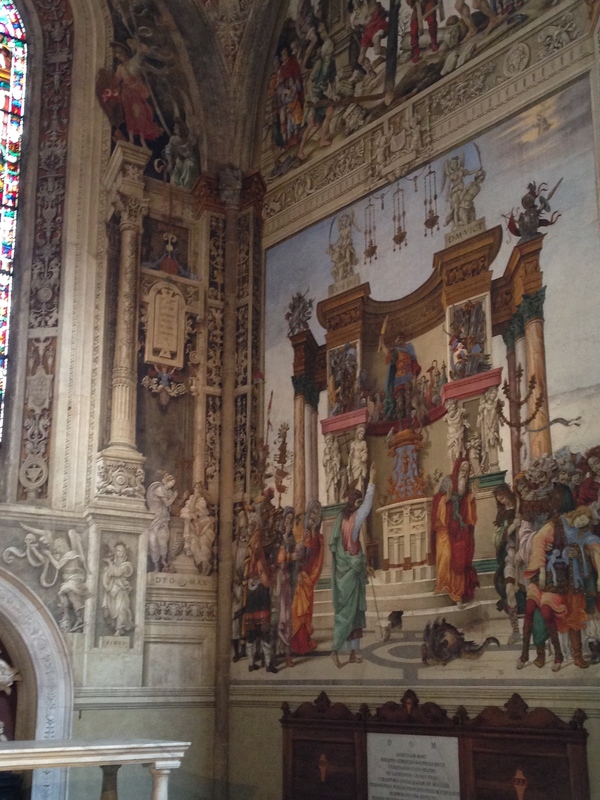 I am now in Firenze (Florence) and my room has 18 foot ceilings with paintings and frescos and the walls are the same. More photos tomorrow. My Mom went to school in Firenze to study Italian after high school. We are going to dinner near her school. She is showing off her Italian everyday and its pretty good. Today, I had a typical Belgian breakfast in Rome. It was a sandwich of ham and cheese, orange juice and another sandwich of ham only. I wanted one of Nutella but the ham was really good. After breakfast my Mom and Dad needed to do paperwork in the “arcade” which has a center for computers and a printer. It also has a tabletop gamer with PacMan, Donkey Kong, Space Invaders and 55 others. I love to play PacMan and Donkey Kong since it was the games my Dad played but he doesn’t do so good with them anymore. 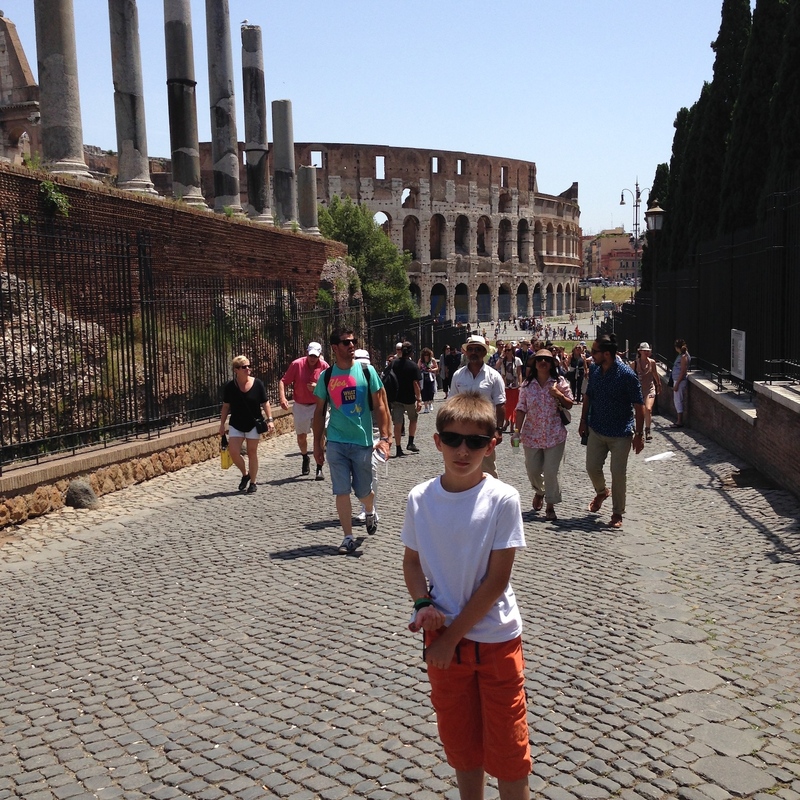 We left for the Colosseo or Colosseum of Rome and the Palantine and Forum. It was awesome. Here are some photos. I am in a hurry to go to dinner so no captions. Ciao! This is Frederick and tomorrow we go to the Vatican Museum, pick up our tickets to the Papal Audience and pack for our Wednesday departure to Firenze but after our visit to St. Peter’s to hear Pope Francis. Today we took a taxi to Borgo Spirito Santo for the 10:00am English mass at Santo Spirito in Sassia Church near St. Peters. 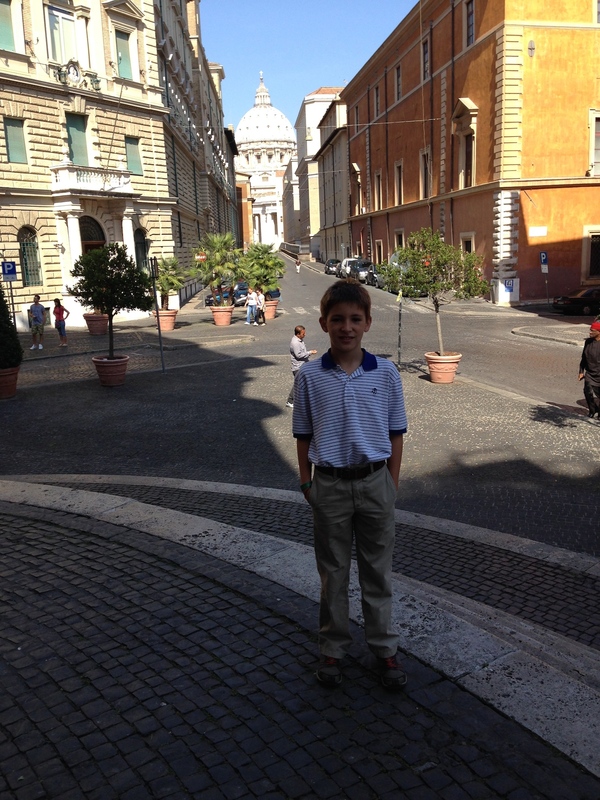 I am standing in front of Spirito Santo with St. Peter’s in the background. 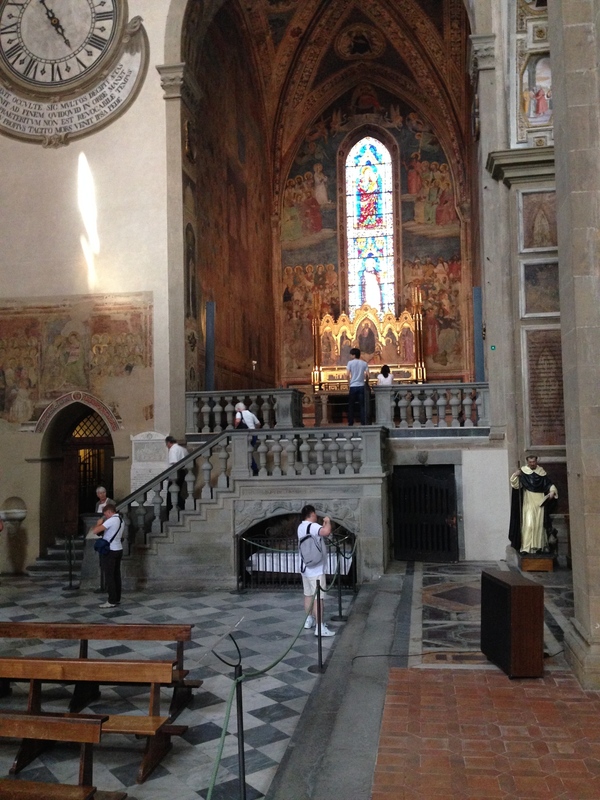 Inside Spirito Santo in Sassia after the 10:00am English mass. It was pretty crowded. The church dates from the 15th century. After mass we walked up to St. Peter’s Square and went into one of the religious shops where I booght some little items to remind me on my stay in Rome and the Vatican. 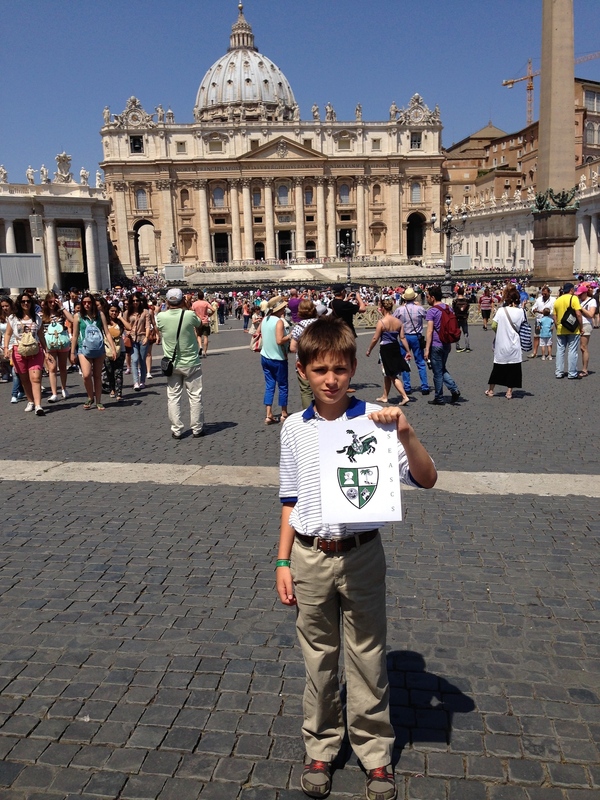 I am holding up the sign we made to show we are from St. Elizabeth Ann Seton Catholic School. The Square is beginning to crowd for the Pope’s Sunday address and Angelus. 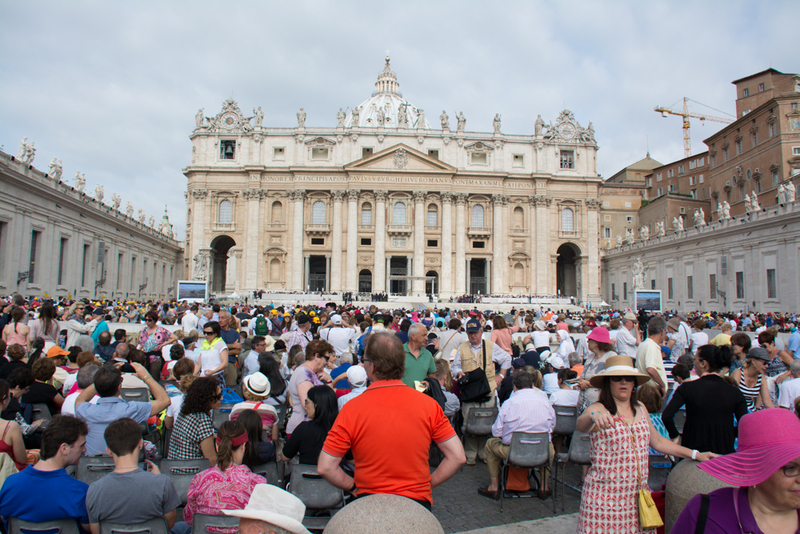 We then walked into the square as it was filling up with other pilgrims to hear from our Pope and say the Angelus with him. 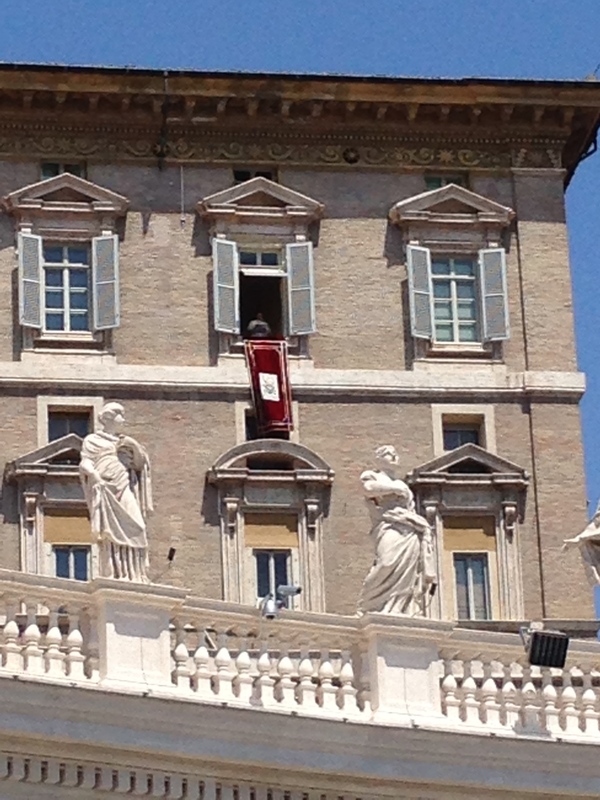 Up in the window is the Pope addressing the crowd of 150,000 in St. Peter’s Square. He spoke in Italian. 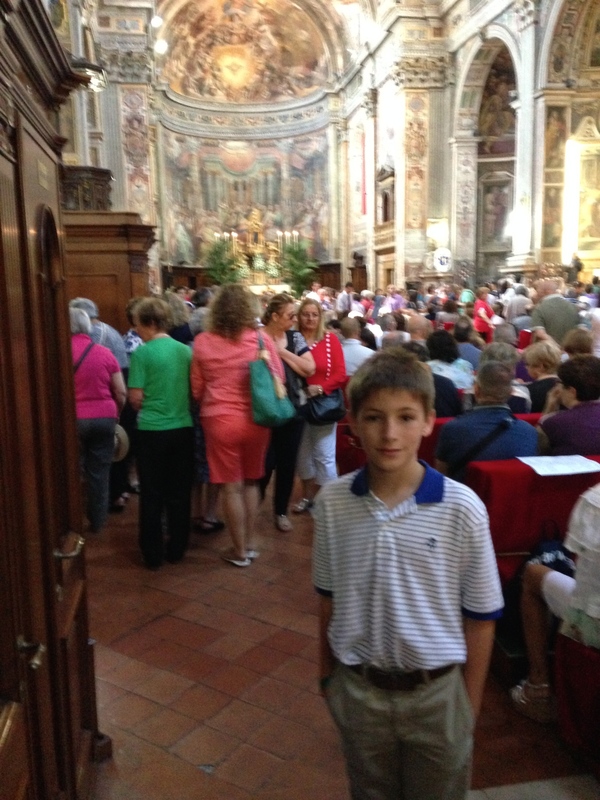 After the Angelus we joined the crowd to visit the church itself. It is fantastic, large and very beautiful. 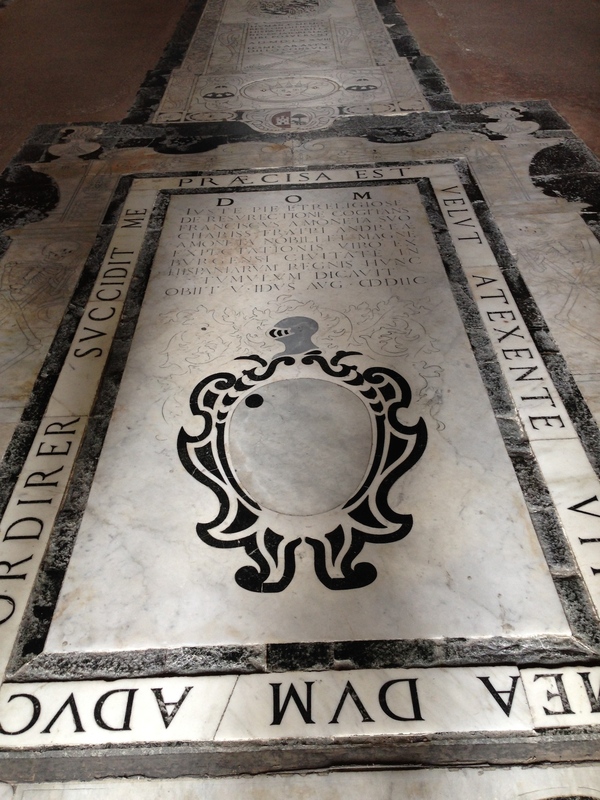 My Mom took lots of photos but down in the crypt where St. Peter and other Pope’s are buried there are no photos. Inside St. Peter’s church. The most incredible church I have ever been in. Even St. Patrick’s can’t compare. it is huge, full of art and statues and architecture. After touring the church we walked outside and met these Swiss Guards. Leaving St. Peter’s we came upon these Swiss Guards at their watch stations. 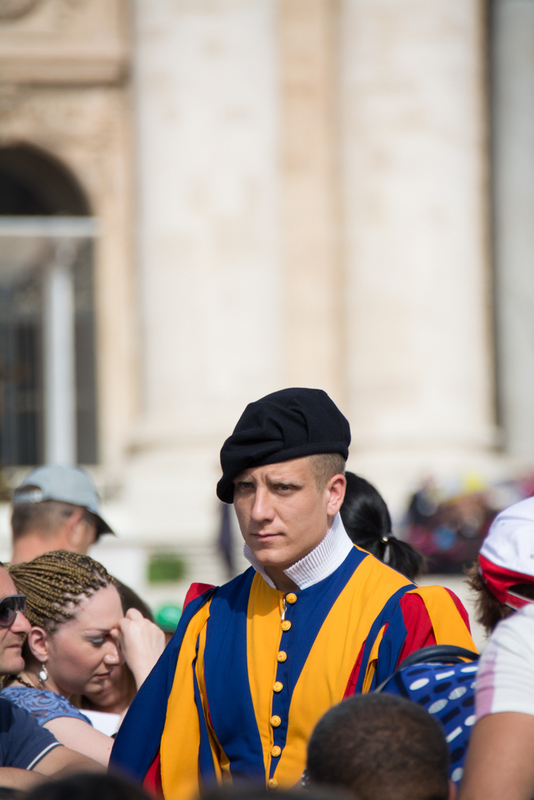 These guys protect the Pope and are very impressive and colorful. Because there is something wrong with my Dad’s iPhone battery, he began to run out of power and this was the last photo of me standing on the bridge with the Castelli San Angelo in the background. 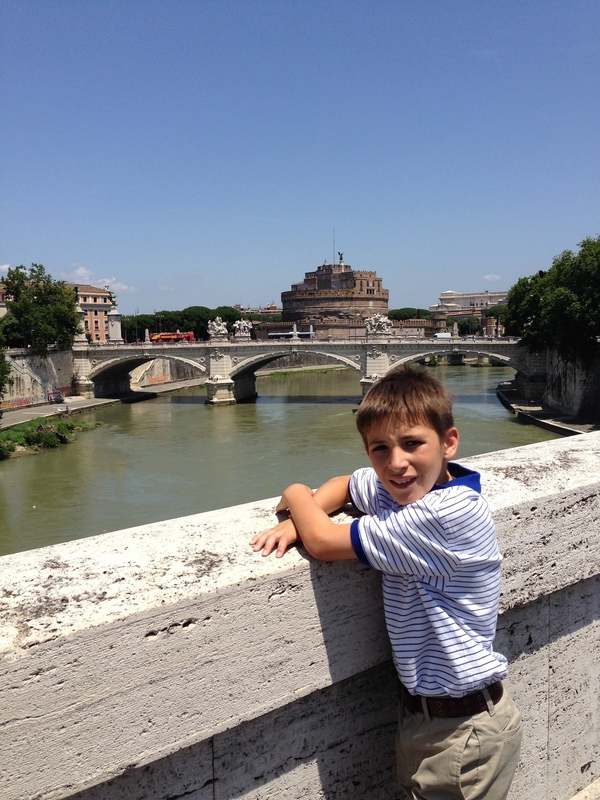 On a bridge over the Tiber with the Castelli San Angelo in the background. 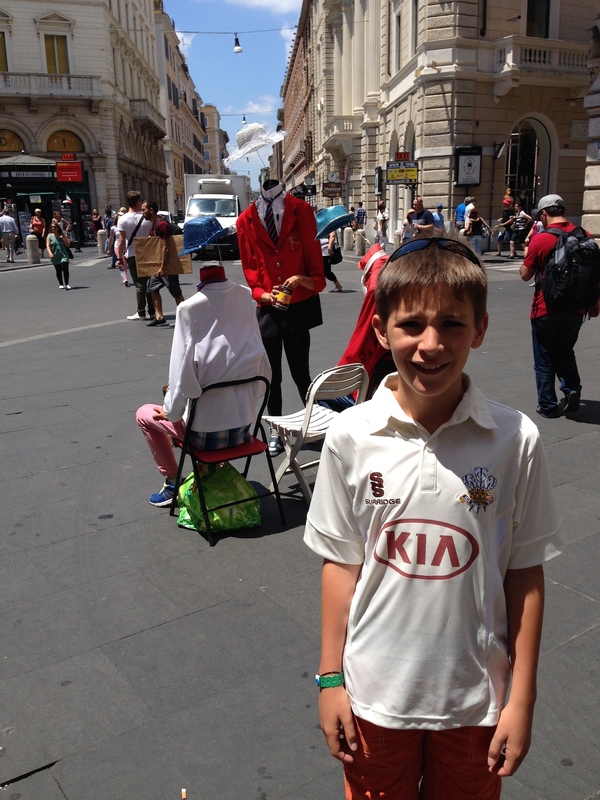 On our way back to Via Arcenio via the Piazza Navona area where we will have lunch. We walked toward Piazza Navona and had lunch alfresco at the Le Pace di Palata where everyone was local and I had to speak Italian. They all applauded when I orderd my Fanta in Italian. 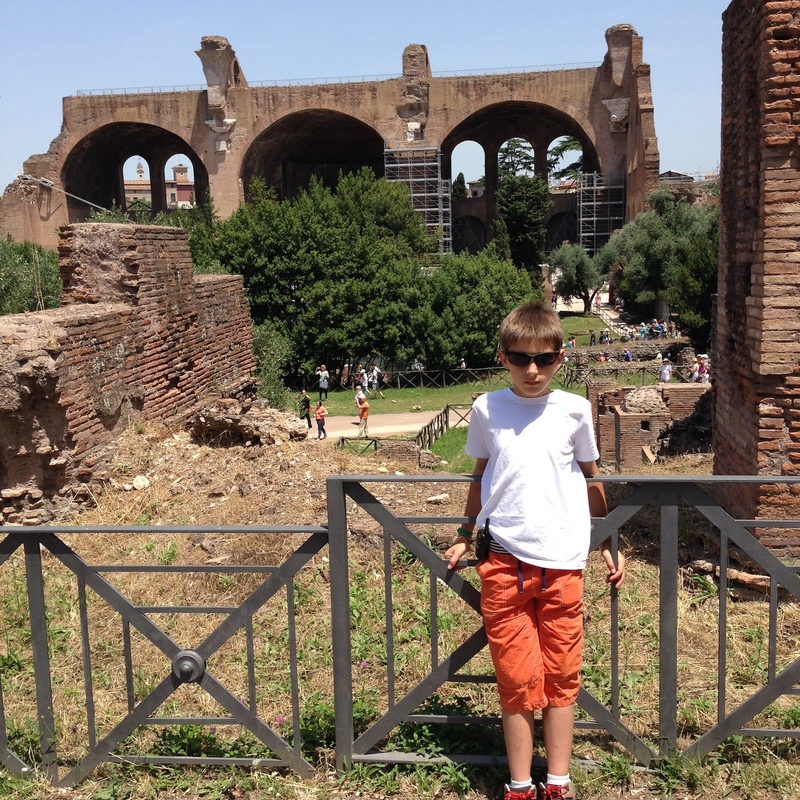 This is Frederick and tomorrow we go to the Colloseo of Roma. Oh, by the way, Go Red Devils, Beat Russia! Some have asked about the guide book I reference. 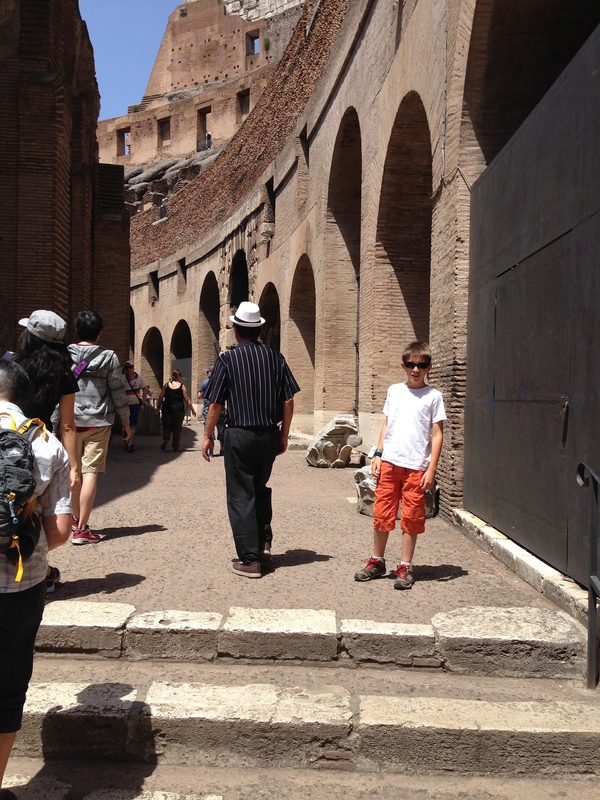 It is called “Rome” by Mauro, Paola, Eric and Jack Lucentini. Mauro is in his 90’s and a very successful and prominent journalist. 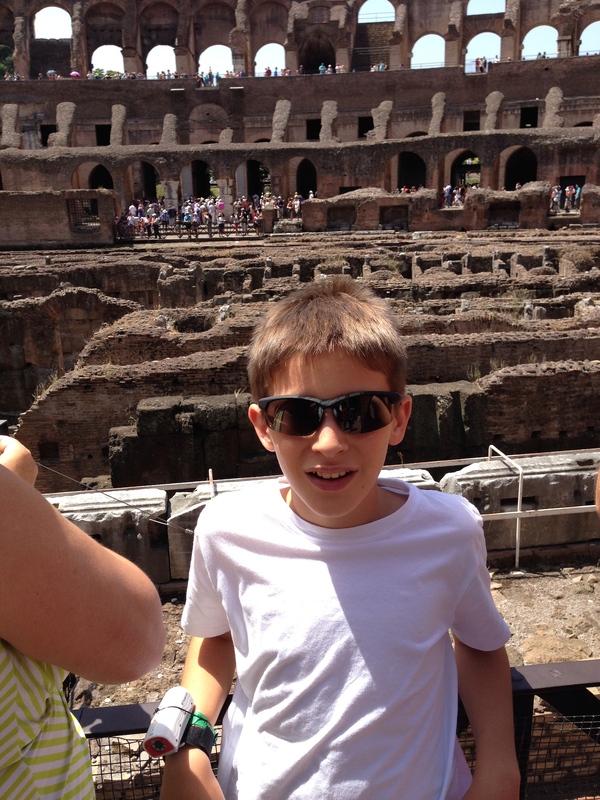 Rome is his hometown, as he calls it. There is also a section on “outside the walls”. My Dad had to buy it online from Waterstones in the UK and have my uncle Jonathan bring it to Paris with him. You can buy it on Amazon but they source it in the UK and it takes a long time to get to the USA. 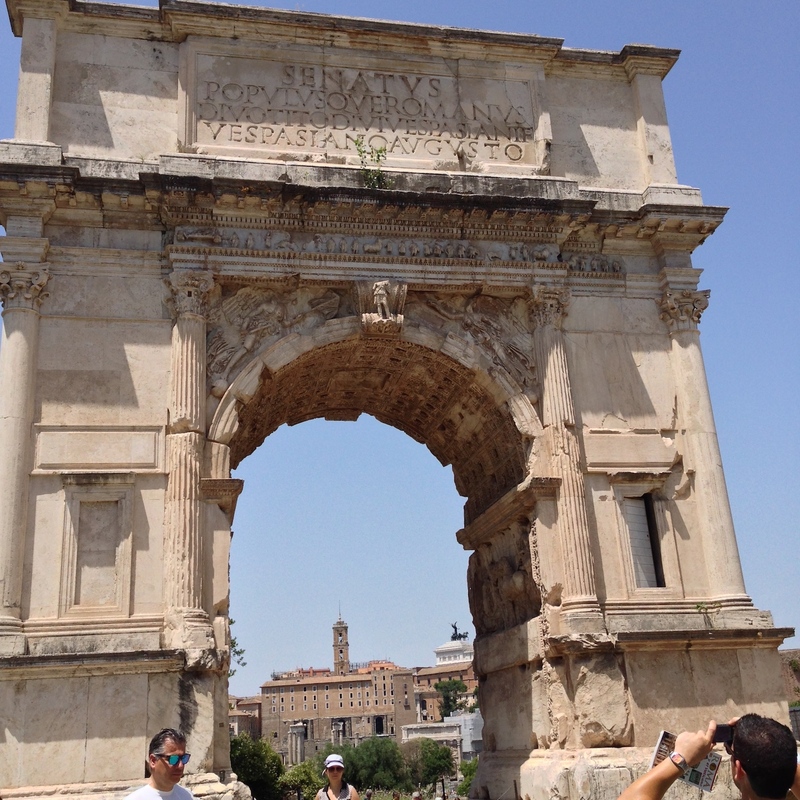 After leaving our ship, the Noordam, we took a car and driver from Citivecchia to central Rome around the Trevi Fountain. We have a nice apartment on Via Arcenio but funny WiFi. Allora! We go to the sidewalk café outside or to The White Hotel and I am able to post. We had lunch on the street in the small café and later that evening dinner alfresco on a small square near our apartment. Today, we woke had breakfast and went for a morning to lunch walk. 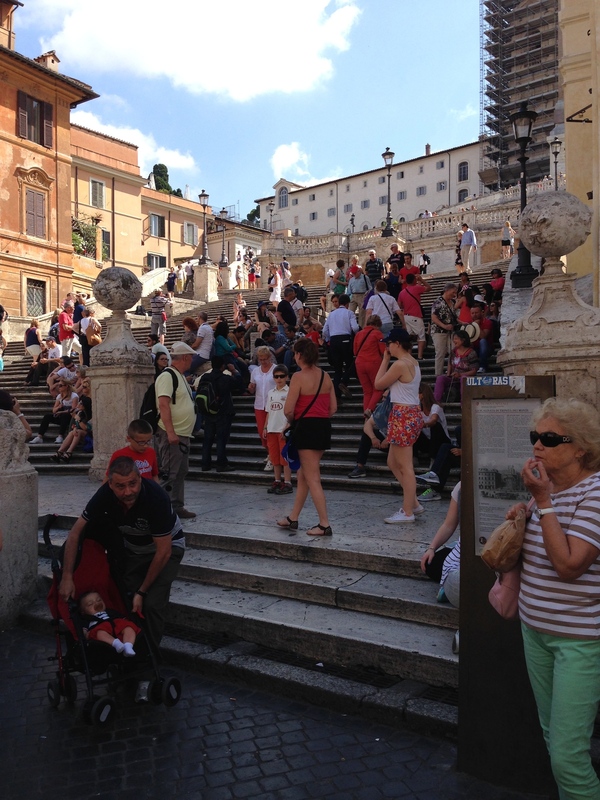 First up to the Spanish Steps and Piazza Spagna which was, like Trevi, closed for cleaning and repair. 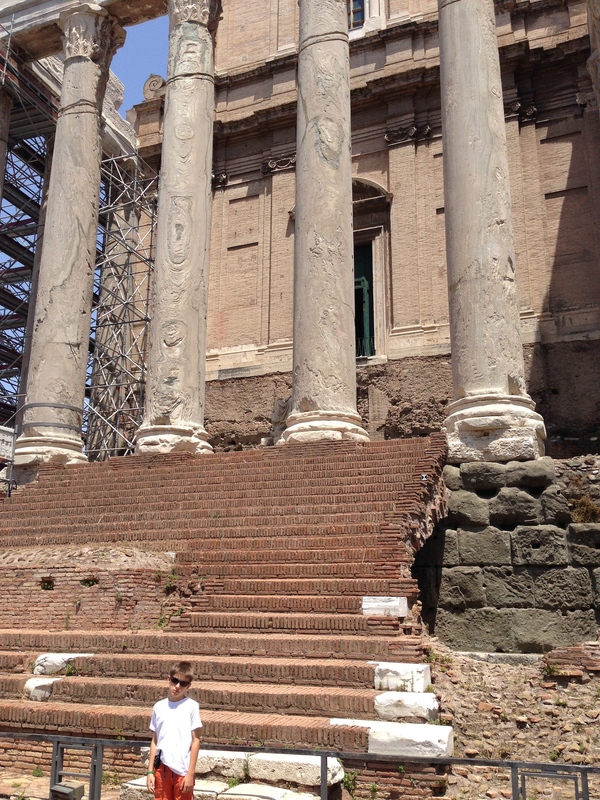 The Spanish Steps at Piazza di Spagna which is under repair just like the Trevi Fountain. 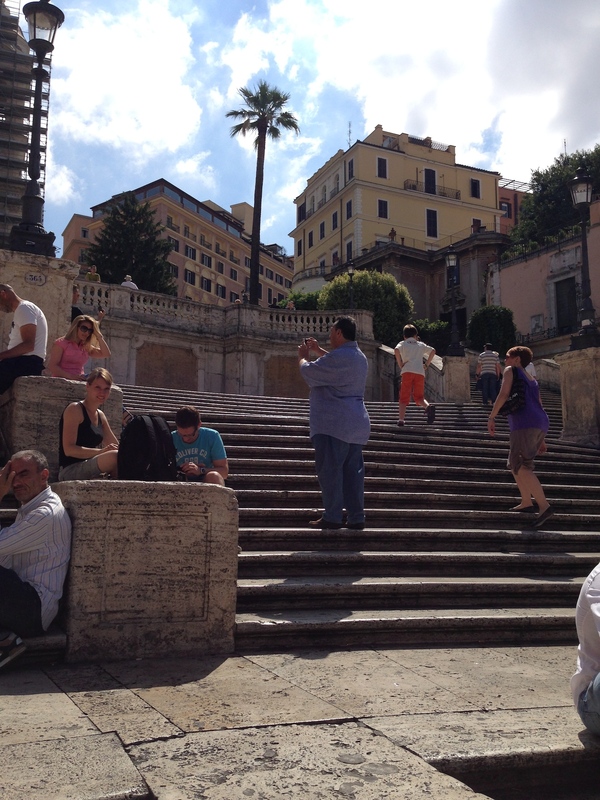 I am on the middle part of the Spanish Steps. Above me on the left is the Hassler Hotel where my Dad has stayed. 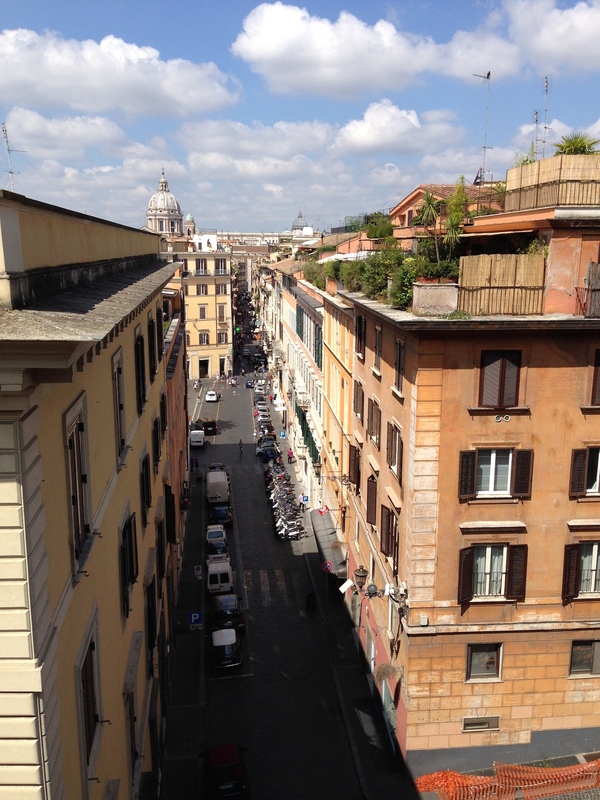 He says it is a very special place to have breakfast and watch Rome wake up from its rooftop restaurant. We then walked up to the Villa Borghese and its beautiful park. 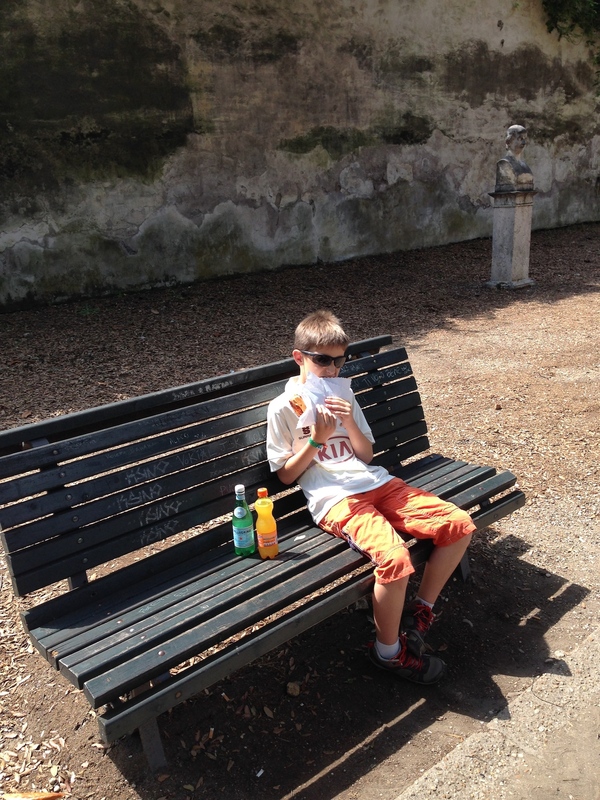 We needed the shade and peace and quite before walking back down to Rome at the Piazza di Popolo. Up in the park is the Villa Borghese now used for special functions and weddings. I was hungry and in the park there are many snack trucks. I got a ham and cheese pizza sandwich from one of them. 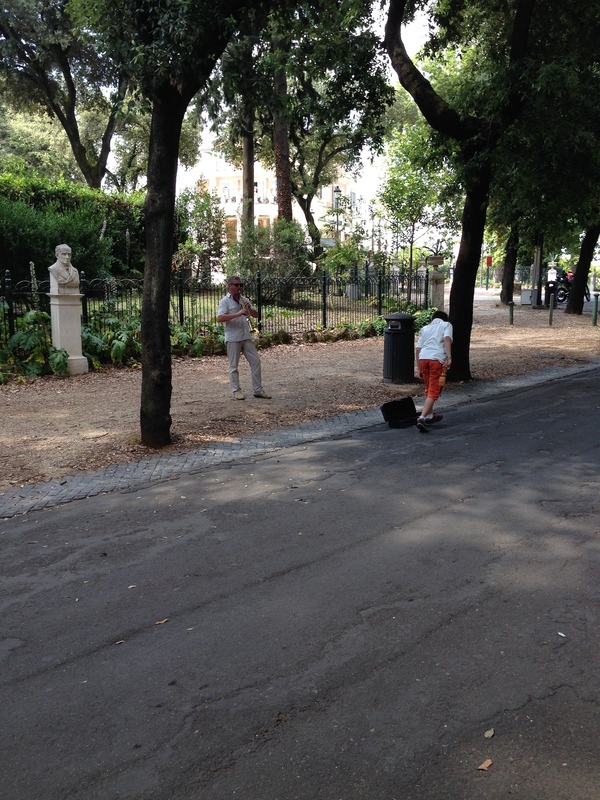 Here I am dropping off a tip to a guy playing the same song over and over again in a Soprano Saxophone in Borghese Park. Looking down one of the streets below Borghese toward St. Peter’s in the far background. 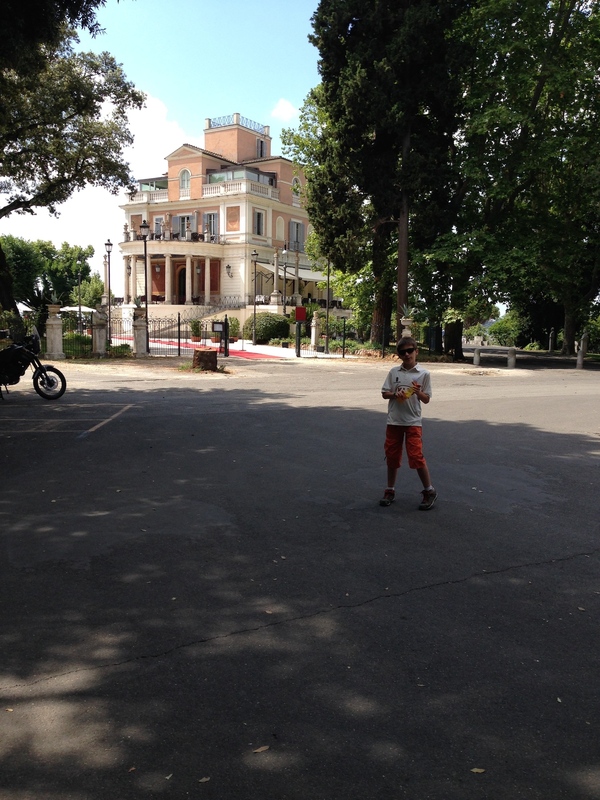 Here is Fred Hollywood on location at the overlook from Villa Borghese down to the Piazza di Popolo where according to Mauro Lucentini, Rome begins. 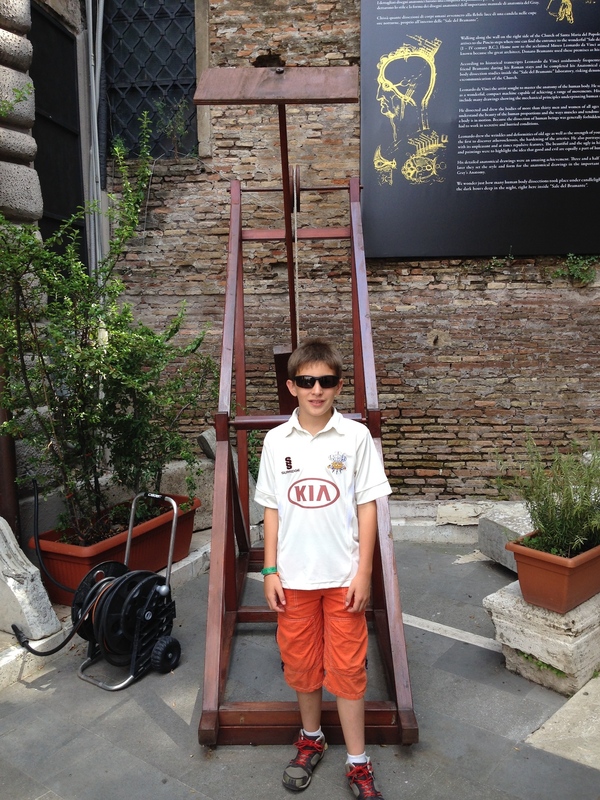 We walked down the steps to the Piazza di Popolo and the DaVinci Museum. Its pretty neat inside the museum because they took his sketches and notebooks and replicated a lot of his inventions, contraptions, and imagination. I like DaVinci since he was way ahead of his time. We are just now catching up with him. Then we went over to the Café Rosati for lunch. Our waiter asked me what whiskey I wanted with my lunch. He was funny. 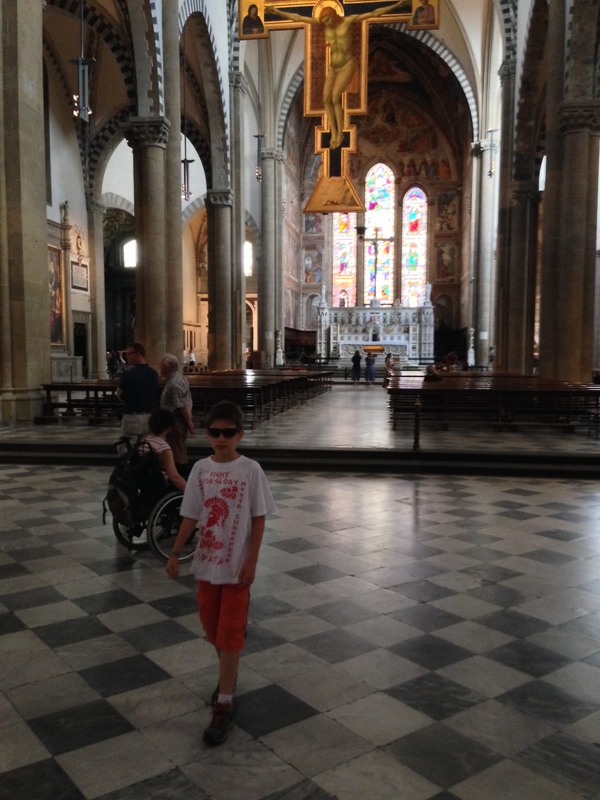 After lunch, we walked down the Via Corso to window shop and stop in the churches for prayers and candle lighting. 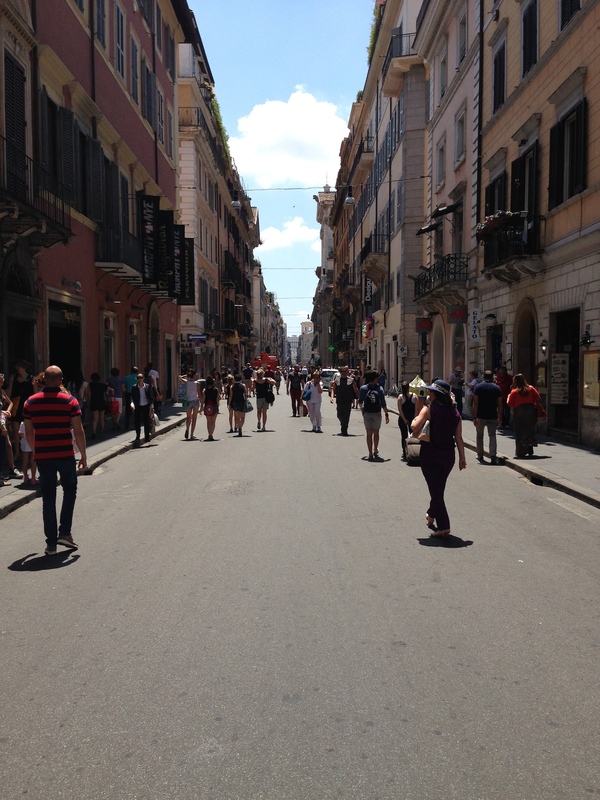 The main street down from the Piazza di Popolo is Via dei Corso that is open to traffic but also walkers. Lots of shops and churches. 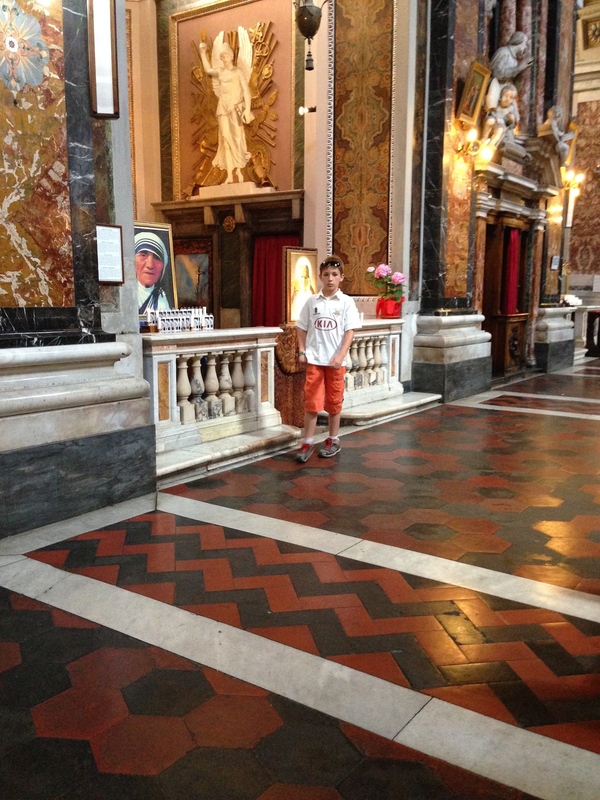 On the Corso is the Church of Jesus and Mary where we went inside to pray and light a candle to Santo Giovanni Paulus II for my deceased grandmothers. At the corner of Condotti and Corso we found these 3 headless street performers. Behind me are 3 street performers without heads. We like to have lunch then walk for awhile then have dulci (desert) at another place. This time we went down the famous shopping street Via Condotti to the Antico Café Greco where my Dad had been before. He had a Café Viennese and my Mom a Macchiato coffe and Napoliane pastry but I had a special lemon sorbet. In the café were an older couple who were regulars and sat at the same little corner everyday and had their drink and little bites to eat. 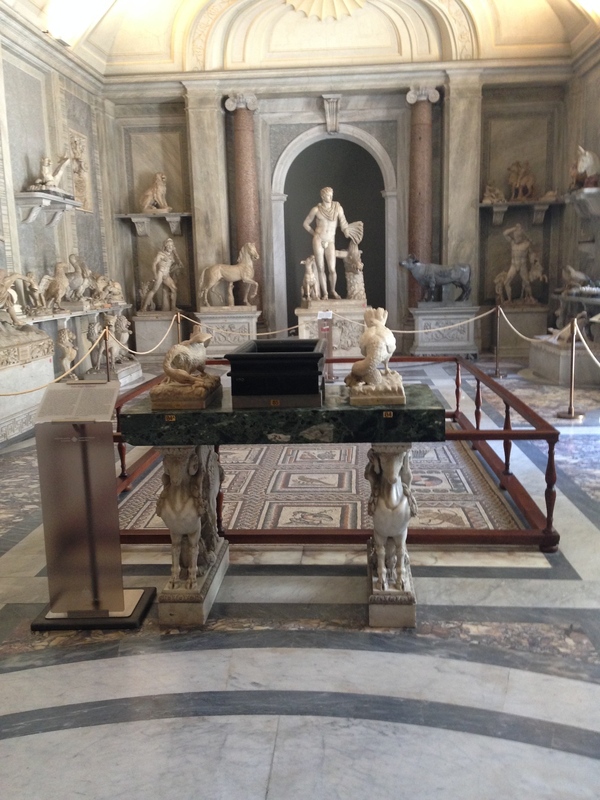 My mom said it was a special slice of life in Rome. 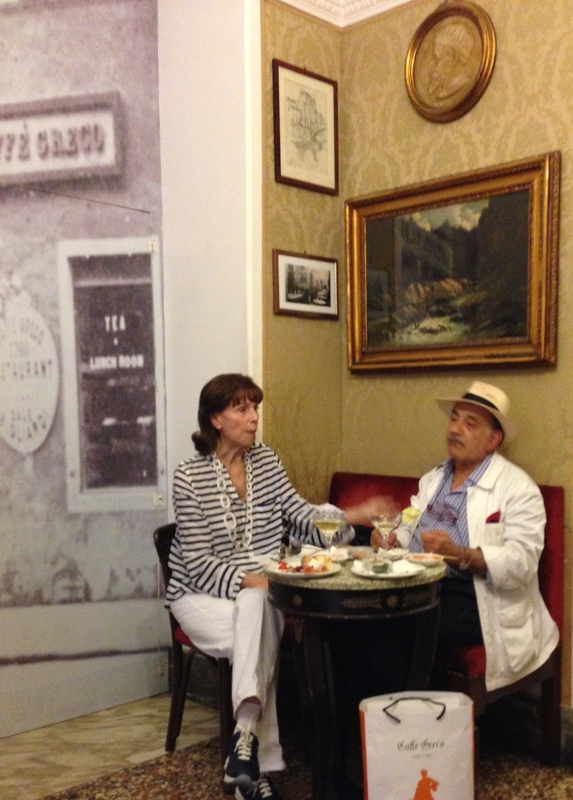 This is a “regular” couple in the Antico Caffé Greco on the Condotti. Drinks, some olives and bread. A little conversation. 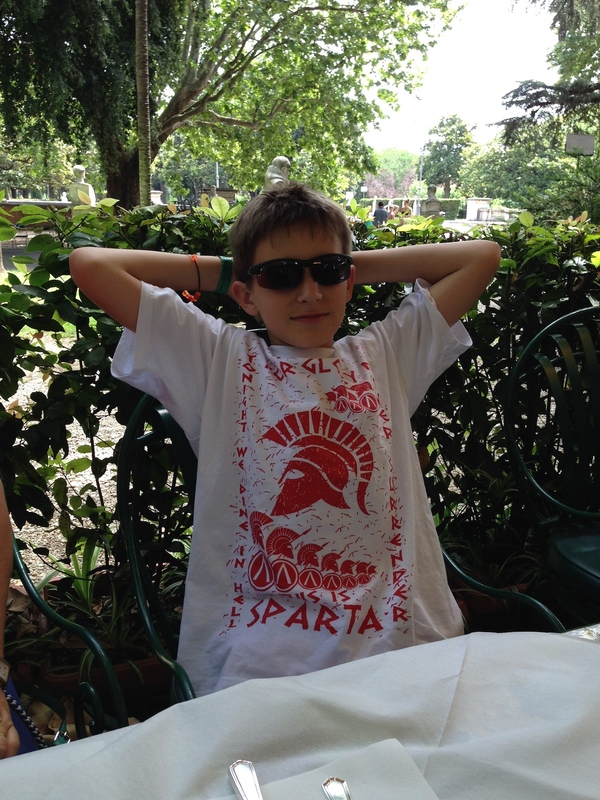 Very roman! 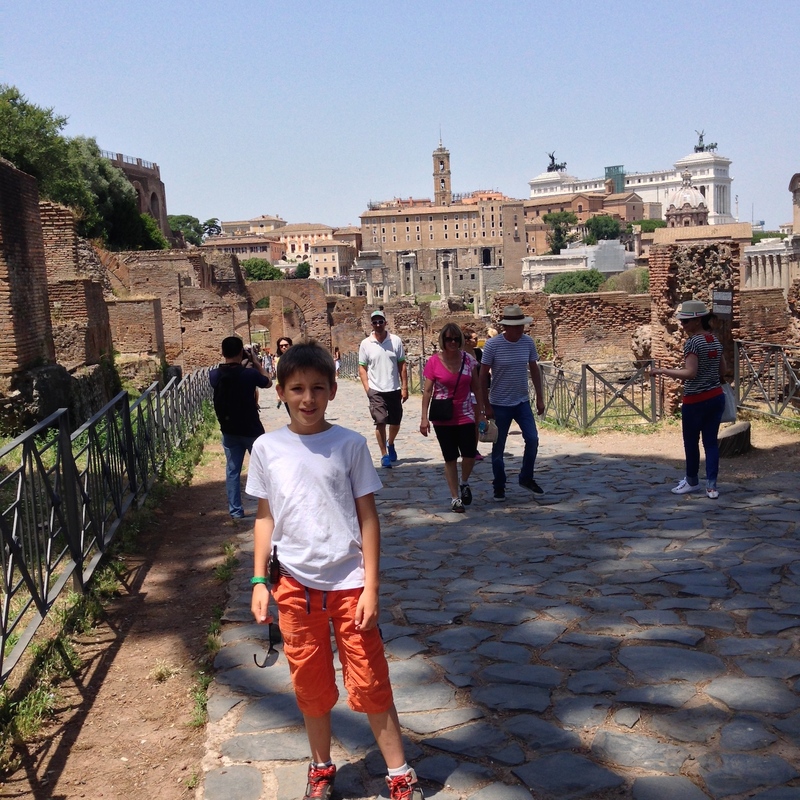 This is Frederick back on the Arcenio and enjoying all of the eternal city. Tomorrow is mass at Spirto Santo near the Vatican at 10am then the Angelus at St. Peter’s with the Pope. Look for it.